HCM CITY - The 63-year-old man from the south-central coastal province of Phú Yên still has difficulty in holding anything with his left hand after recovering from a stroke he had nearly a year ago. A stroke is a medical emergency that occurs when blood vessels in the brain are blocked or ruptured, interrupting blood supply and causing brain cells to die within minutes. The left side of his mouth had suddenly drooped after forgetting to take medicine one day for his hypertension. The drooping is one of the warning signs of a stroke. His family members discovered it and suspected he had a stroke and rushed to a local hospital, but his situation steadily worsened there. He was transferred to Thống Nhất Hospital in HCM City. “Doctors at Thống Nhất Hospital said he had been brought to the hospital late and so he would suffer from hemiplegia, or paralysis of one side of the body,” his daughter said. At the hospital, he was given western medicines to dissolve the blood clot and improve blood flow to that part of brain together with traditional medicines, acupuncture and physical therapy. “My father is now taken care of at home. However, his legs are still weak, making it difficult for him to walk,” she said. The association’s statistics show that more than 200,000 people are reported to have strokes each year. Strokes are the leading cause of death in the country, Thắng said at talk show on Healthy Aging: Is stroke preventable or not? held in HCM City by HCM City Public Health Association in co-operation with Bayer. “At the People’s Hospital 115, where I work, nearly 15,000 stroke victims are hospitalised for emergency treatment each year,” Thắng said. According to the HCM City University Medical Centre, it admits 100-120 patients with strokes every month. Việt Nam’s proportion of people aged 60 or above is set to almost triple from 10.7 per cent of the population in 2016 to 27.9 per cent in 2050, and so will the number of people suffering from chronic diseases such as hypertension, diabetes, and heart disease. People aged 60-70 with hypertension and diabetes are at high risk of a stroke, according to Dr Thắng. They can get a stroke if their condition and diseases are not well controlled. People with atrial fibrillation, which is the most common type of irregular heartbeat, also face a high risk of strokes. “If atrial fibrillation is not treated, it increases the risk of strokes by five times. It is worrying that atrial fibrillation is not detected and treated in a timely manner,” he said. The new generation of oral anticoagulants for atrial fibrillation is more effective than old ones, according to the doctor. Young people also suffer strokes, and those who drink alcohol or smoke a lot are the high-risk group. The People’s Hospital 115 has been admitting more and more people aged below 40 with strokes. On October 23 a 26-year-old man from Tân Bình District was being treated at the hospital’s vascular diseases department. He was brought to the department with paralysis of the left side of his body. 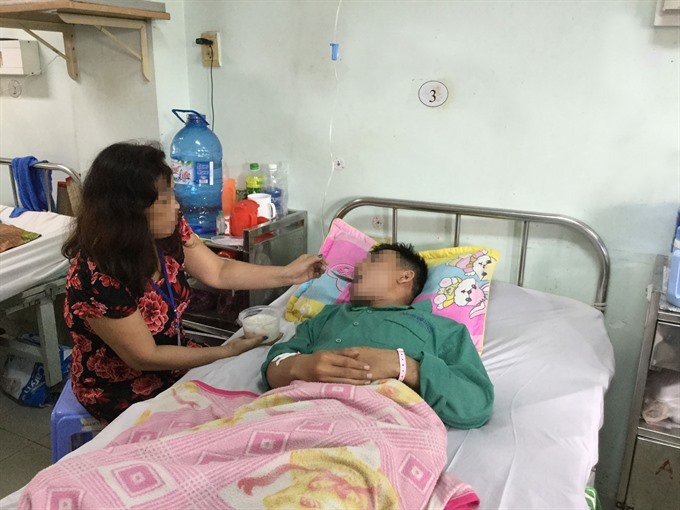 Early this month the HCM City University Medical Centre admitted a 39-year-old man from District 6 with weakness in a right arm and leg and difficulty speaking. He was diagnosed with an acute stroke, and the centre’s doctors began emergency treatment. Dr Nguyễn Bá Thắng, head of the centre’s strokes unit, said people aged below 45 accounted for nearly 30 per cent of stroke victims at the hospital. Dr Cao Tấn Phước, deputy head of Trưng Vương Hospital in District 10, said when a person suffers a stroke, their family should call an emergency aid centre to take them as soon as possible to the nearest health facility that can treat strokes. When doctors manage to save brain cells, the risks of many disabilities reduce, according to Phước. It is absolutely vital that the victim’s family should not provide any first aid, especially based on recommendations on the internet -- such as using a needle to prick fingertips -- because it could worsen their condition, Thắng said. There are 50 centres around the country offering advanced treatment and medicines to treat strokes to reduce mortality. In HCM City, the Department of Health plans to create expertise in many hospitals for treatment of strokes, including People’s Hospital 115, Chợ Rẫy Hospital, and Thủ Đức District Hospital. Dr Trần Thị Lan Hương, medical director of pharmaceuticals division at Bayer in Việt Nam, said “strokes are preventable and it is very important to adopt preventive methods”. “Periodic health examination to detect high risk factors that can cause strokes should be done,” Thắng said. According to Hương, when young people lead healthy lives by not drinking beer or alcohol or smoking, the risk of strokes reduce. Physical exercise is also vital.